Media and Contents: 180mm x 250mm soft cover with 80 pages, 49 period black and white photos, 12 colour artworks including two on the cover. Advantages: Explains a part of the U-boat war that many modellers don't understand. This book is not about the ships and crews from either side involve in Germany's U-boat Operations against Britain in the Second World War. It is about the tactics employed by the U-boat arm of the Kriegsmarine trying to stop the transport of arms and food to England and those of Britain's anti-submarine forces in trying to stop the carnage caused by the U-boats in the North Atlantic shipping lanes. What many people don't realize, U-boats, in fact submarines of all nations at the beginning of WW II, were not really submarines but submersible surface ships, designed to fight on the surface and only submerge to escape detection or destruction or get close enough to attack an enemy. Not until the very end of the conflict with the introduction of the Type XXI U-boat, was there a true submarine capable of diving after leaving harbour and not surface again until the end of its patrol and home coming. Fortunately, very few of these became operational before wars end. After a short introduction, the first chapter is headed Convoy Night Surface Attacks. With sub-headings of The Kretschmer Method, 1940-41 and The Official Doctrine, 1943. This covers the tactic perfected by Otto Kretschmer in U-99 of creeping into the middle of a convoy, on the surface, at night time and using the darkness to avoid detection. The fact that, although sunk and taken prisoner in 1941, he remained the war's highest scoring U-boat commander and seems to indicate that the tactic worked. The 1943 Doctrine Hand-book outlines these tactics. The next is Deck-gun Attacks. The theory: rules of interception of merchant ships, the practice and the official doctrine. Torpedoes cost a lot more than shells and far fewer can be carried. Solo Missions. The attack of U-47 at Scapa Flow, U-81 and U-331 in the Med., North American waters 1942 and the Far Eastern waters, 1943-44. This chapter tells of many of the solo missions and why they were or weren't a success. 'Wolf Pack' Attacks. 'Free Hunting', Patrol/Reporting Lines, Fast Patrol Lines and The Turn of the Tide. Kriegsmarine-Luftwaffe Co-Operation. The FW 200C Condor and Combined Air-Sea Strikes. Associated Equipment. Bachsteize (Wagtail) and Midget Submarines. Offensive Weapons. Torpedoes, Torpedo Guidance Systems and Mines. Defensive Equipment. Radar Decoys, Sonar Decoys and Protective Coatings. Defensive Tactics. Against Warships and Against Aircraft. 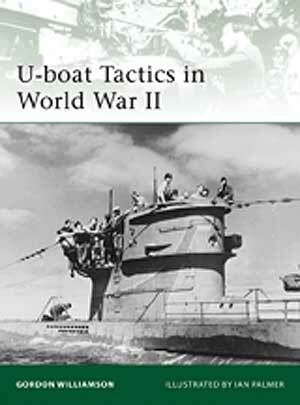 The whole book has many B&W photos showing all aspects of U-boat warfare including the boats themselves, personalities (Kretschmer, Prien and Donitz etc,) and living conditions. There are also many full colour diagrams showing how convoys were approached and many other of the tactics of the U-boat war. Of all the maritime models on the market, German U-boats would have to be one of the most popular, being produced in at least six scales from 1/72nd to 1/700th. While it won't help the modeller to build or paint the model, this book will give him or her an understanding of why some boats were more successful than others and why the war was ultimately lost.